Russian drones will start monitoring the situation in the Arctic as well as on a part of the Northern Sea Route starting May 1, authorities announced. The vehicles can be used in navigation as well as in search and rescue missions. 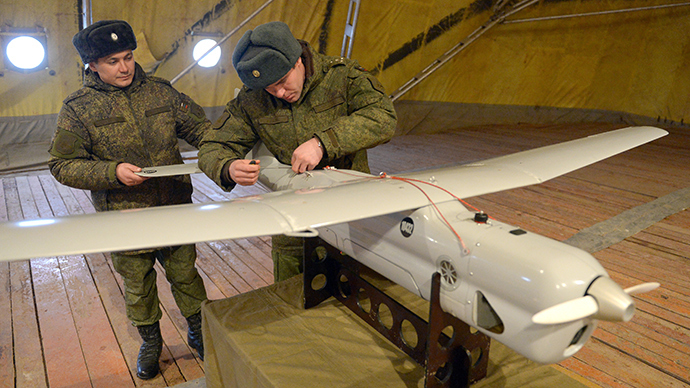 "The drones’ task is to maintain impartial control of the situation in the Russian sector of the Arctic, including the ecological and ice situation in the adjoining sea areas and along the Northern Sea Route," Colonel Aleksandr Gordeev said. The division of UAV [Unmanned aerial vehicle] Orlan-10 of Eastern Military District will deploy in Chukotka [Peninsula] from May 1. Produced at the Special Technological Centre of Saint Petersburg, the Orlan-10 drones are capable of reaching speeds of 90-150kph. The drones will perform such tasks as “managing objective control over the situation in the Russian Arctic,” and section of the Northern Sea Route, Gordeev added. The vehicles will be delivered aboard Mi-26 heavy transport helicopters to any area for monitoring the situation in the Russian Arctic, navigation as well as in search and rescue missions. Plans to implement drones in the Arctic were revealed at the end of 2014. The test flights of Orlan-10 started in March 2015. Russia has recently started developing its northern regions, which includes the production of hydrocarbons, with national companies developing the exploration and construction of drilling facilities. Home to the largest icebreaker fleet in the world, Russia is the only nation to use nuclear-propelled icebreakers. With climate change making the Arctic region more accessible, Moscow sees its development a priority both for the sake of its natural resources and as a potential route for transport vessels from Asia to Europe.